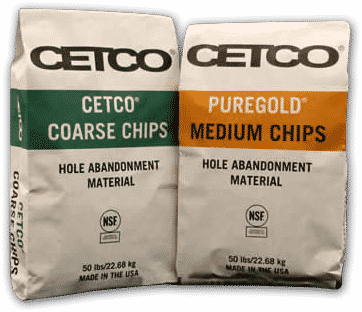 Cetco® Coarse Chips are natural sodium bentonite screened to 3/8″ to 3/4″ in size. PureGold® Medium Chips are natural sodium bentonite screened to 1/4″ to 3/8″ in size. Both provide a permanent, flexible seal between gravel pack and bentonite or cement grout. Both products are certified to NSF/ANSI Standard 60, Drinking Water Treatment Chemicals – Health Effects.